Discussion in 'SiriusXM 2.0' started by me_rubin, Mar 9, 2012. How about that? Did you find it on accident, or were you experimenting and looking for it? My Lynx had locked up, so I was pressing buttons to try to get it unlocked. I did not want to pull the battery. At first I was not sure what sequence I had pressed, but then I started experimenting and found a consistent way to get into the System Recovery mode. 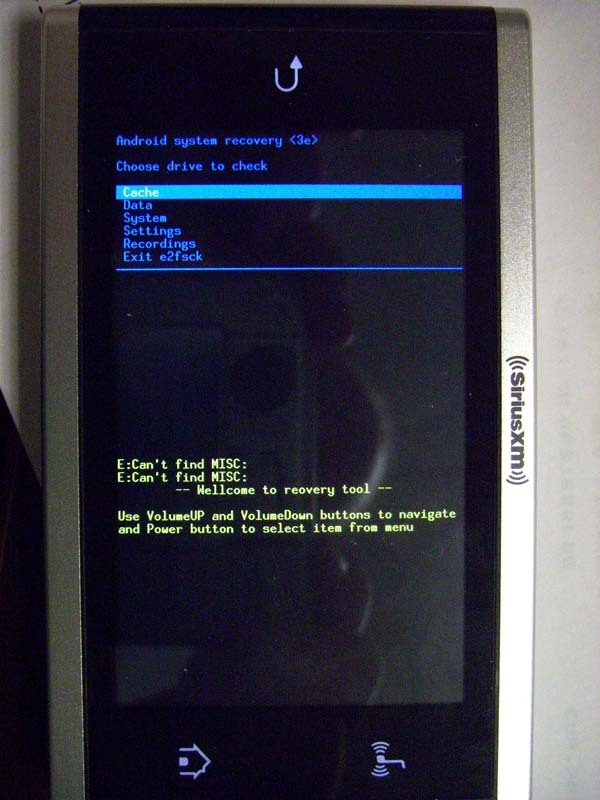 This is the exact screen I use to install custom roms on my Droid phone. I use apply update.zip to install a new rom, so this could be a gateway to installing custom roms that could run. If I had one right now, I would try to install a stock Froyo 2.1 Build of android and see what happens, even though it would probably be bad. Sadly, the rom community isnt paying attention to the Lynx so a chance of a good dedicated Dev to create a Rom that works with the Lynx 100%. But this is very exciting to me, at least. Anyone who has the ability to should definently test running a babrebones Android build on this via the update.zip command. The keystrokes can't be too hard to figure out. If its anything like my phones, it'd be power+a volume key or something similar. But yes, anyone who messes with this is likely to brick their radio if they are not sure how to recover it. Or at least get a Soft Bricked device. The keystrokes can't be too hard to figure out. I would try it myself right now if I had one, even though I'd risk bricking it. I've done enough tooling around with this stuff enough where I'd feel somewhat comfortable applying updates and trying to crack this baby open. I a currently posting on the XDA forums and asking around for anyone who might know if this can accept any roms that are currently out. I am already drooling over the possibilities. 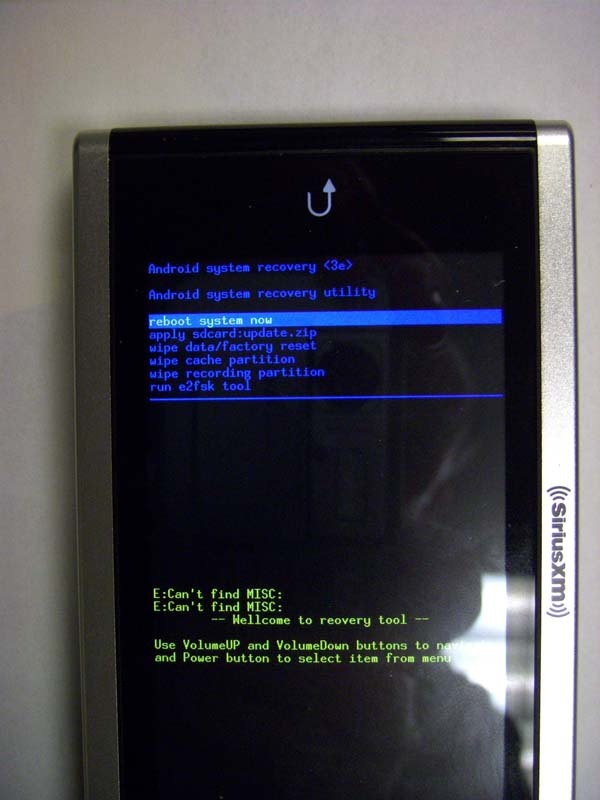 Getting a custom recovery on the lynx, we can do a backup of the radio system files, and flash new roms and 'backup' your current recordings and stuff. How do you do a backup of the radio system files? etc. well, I would assume that could be done, if a version of clockworkmod recovery or similar could be flashed on here, it allows backup of the different partitions, etc. That menu is identical to a typical recovery menu on an android phone, but the 'recording partition' is 'internal sd' on my phone. So, if we can flash a new recovery on it (it looks the same as the default recovery, but with backup/restore options) we could essentially backup the entire radio, and even just backup or restore the recording partition, so say you have a big block of music you can backup it up, wipe it clean, record more, and so on, and restore your old partition as you need. of course, this is all reliant on how easy it is to flash a new recovery on to the radio but in my expierence, this is something that a good dev could hopefully do easily. 3 finger salute. Haha wow, completely just had a flashback to the S50 days. What a headache that little booger was. Glad you found us, but sorry it's because your radio crapped out. Most of the Lynx's have been pretty stable, and we haven't had too many people with bricks. Not like the S50's anyway. If you want to try to tinker with it yourself, try sending DrDroo or Me_Rubin a personal message to see if they have any tips for you. In the meantime, someone else around here may have some advice for you. I would try going back to that recovery screen, wipe cache, data, and recording partition. run the e2fsck tool and check each and see what it says. pull the battery out and remove any sd card as well. pop the battery in after a minute. see if ut boots any further. if possible put it in a dock and let it sit for an hour or so.